These photos were shot a few weeks ago while I "tested" out one of our tops before I added it to the store. (Tested as in I won't live with myself if I don't wear this at least once.) Although it's long gone, as I was browsing a popular company's new styles I just had to take a screenshot as proof of how some vintage styles are simply timeless. I think the resemblance is uncanny. Stay tuned for more! Ohhh!! Shirt in red is perfect!! Your shorts are so cool!! Many kisses!! Gorgeous outfit. Very natural, easy and pretty. Ohhh girl, I love your style! You're my inspiration! I love the blouse and the bag! :) Kisses! 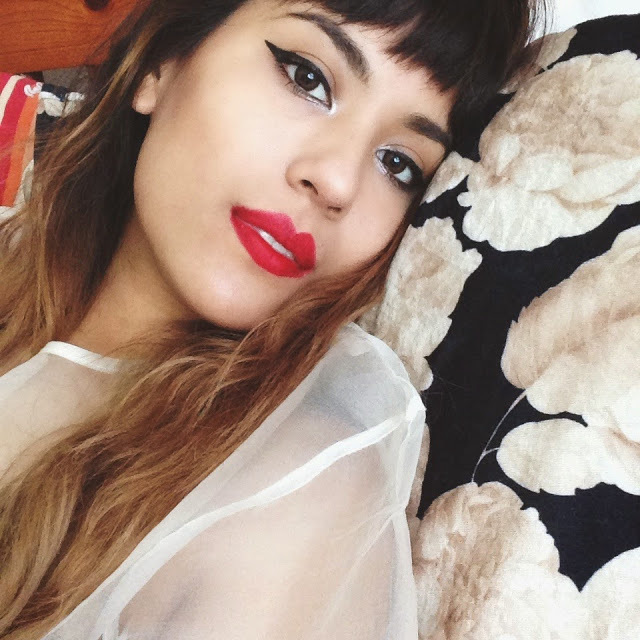 you reminded me so much of Jameela Jamil here! :) heh, cute look! How cool you are??? I looove your shirt! I have to check out Tarte Vintage on FB!!! You look extremely gorgeous!!! Sweetie you just look stunnuing!That´s a goegeous combo! I whish it was warm enough in the Netherlands to wear such an outfit. I really like those shorts. nice top! I like the way you combine the top with shorts. lovely outfit!! !this red color is amazing!! I love chiffon!! I just posted a chiffon top too! They are great in spring and summer. I bought some from Zara just recently and will wear it soon too. I love your 2 color top. Red with white collar and sleeve-ends. Pretty! Just found your blog, and I'm loving the posts! I would love if you could check mine out, it's new, and still getting going. I'm loving that top. The red just makes such a big statement. I might need to buy one. Gorgeous outfit, i love the red on you. Love this outfit! I like the red color! You're beautiful! Love your outfit! Thank you so much for you comment! It's so great to hear that someone with such an amazing blog herself likes mine! You style is so unique and so is your blog! I'm definitely going to follow and check back soon! i love it. such a perfect go to outfit. Thank you for your sweet comment! Amazing look, the color is perfect. You styled this so well! OMG！！！！Are u at CSULB campus!!?? You look awesome! I am a fashion major students in CSULB, I want see you someday! and i wanna wear shorts!!!!! I love your outfit! So amazing! Love ur oufit! the blouse s amazing! Thanks for visit my blog, i follow you! chic, fresh and you look GREAT!! We like this outfit so much. You are fantastic in the photos.